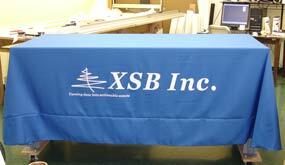 Custom Tablecloths and Logo are 100% Polyester. A custom tablecloth and logo may be made in a number of different ways. A custom tablecloth may be cut to accommodate your custom sized table. Standard tablecloth sizes are six and eight foot in length. Occasionally a custom tablecloth and logo size is requested for a four foot table. 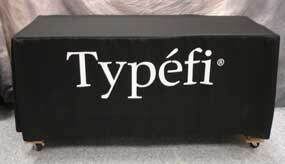 Your logo on a custom tablecloth is great for advertising and delivers maximum impact for your advertising dollar. The Custom Tablecloth with your Logo maximizes your Tradeshow image. Putting your logo on your custom tablecloth, shows your customer and prospect you're proud of your logo and your custom image. For tips on designing your Custom Tablecloth and Logo, see some examples of what others have done to customize their tablecloth and logo. The Custom Tablecloth and Logo show above is known as a "Fitted" tablecloth. Tablecloth terminology would also identify a tablecloth as a "Table Throw," or "Table Cover." Custom tablecloths may also be fitted. The ends of the tablecloth hang straight as opposed to bellowing out at the ends of the table. Over fifty standard Tablecloth Colors available to choose from will give you the custom look for your tablecloth you need to stand out from the crowd. Our Tablecloth and Logo displays may be seen throughout the United States as we manufacture for competitors and authorized Tablecloth dealers. 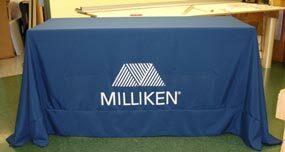 Milliken is a textile manufacturer based in Spartanburg, SC. Their tablecloth as seen to the right is an eight foot tablecloth. The picture was taken while their tablecloth was on our six foot work table. So it appears that there is more tablecloth fabric than necessary.